Are you looking for a delicious vegetables recipe with a difference? If you are, you’ve found it! Here’s my roasted squash with chilli and sage crumbs for you to enjoy. I don’t about know you, but I sometimes get bored of always having potatoes with my main meal. I created this in order to still have a substantial side dish, but with more exciting colours and flavours. 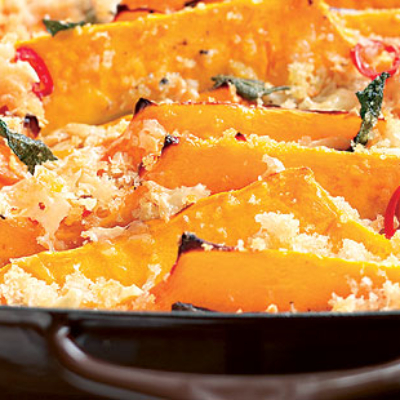 Try this recipe with pumpkin when it is in season and you can use Parmesan cheese instead of Pecorino. 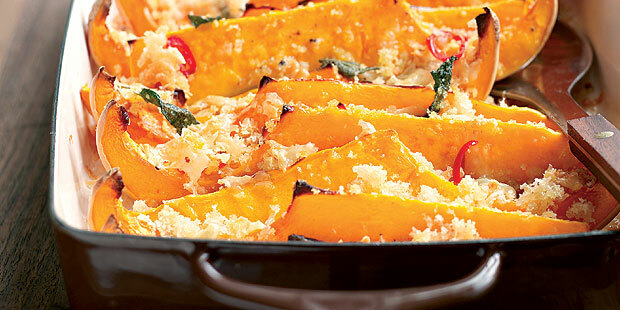 Feast your eyes on the finest roasted squash with chilli and sage crumbs! It’s straightforward and fun to make this great dish. Simply follow the instructions below and get the perfect result. Preheat the oven to 200ºC/400°F/gas mark 6. Put the breadcrumbs in a bowl and drizzle over half the oil. Season with salt and pepper and toss together. Place the squash in a roasting tray, drizzle with the remaining oil and sprinkle with the chilli, garlic and sage. Season with salt. Sprinkle over the breadcrumbs and the cheese and bake in the middle of the oven for about 40–45 minutes until tender and golden. Serve hot. 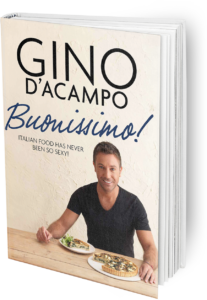 Once you’re done, simply sit back and enjoy your roasted squash with chilli and sage crumbs and don’t forget to check out other great authentic Italian recipes including great antipasti recipes, Italian pasta recipes, Italian soup recipes, Italian beef dishes and authentic pizza recipes. Anchovies are found in large numbers in the Mediterranean, particularly in southern Italy, where they are a staple food and are eaten fresh or preserved in olive oil or salt. They’re high in antioxidants, and some research suggests they may be linked to longevity. If you prefer, replace the anchovies with black olives. Gorgonzola and walnuts have always been a great combination. I find that they work perfectly with pasta and rocket. Of course you can eat this dish hot, but if you are making it for the following day make sure you eat it at room temperature and mix well before serving. If you prefer, substitute the Gorgonzola with any hard blue cheese of your choice. This dish is rather retro and I used to make it when I first came to London as a teenager. Make sure that the avocados are perfectly ripe and don’t use buffalo mozzarella, as it will release too much milk during cooking. Grilling the avocado makes it softer and more velvety, but don’t overcook or it will turn mushy. Serve with your favourite salad leaves.